For the fourth of July we decided to throw a last minute BBQ and instead of going to the store to pick them up I went digging trough my deep freezer. I found a pack of chicken wings. I thought these would go great on the grill but I didn’t want the normal buffalo style wings because being pregnant I cant stand that style right now. I wanted something with a nice Korean twist and these Korean BBQ Grilled Wings are so yummy! In a sauce pan heat over medium high heat sauté the oil and ginger for 3 minutes. Add the chicken stock, vinegar, sesame oil, honey, soy sauce, and chili garlic sauce to the pan. Simmer for 10- 15 minutes, until desired consistency. 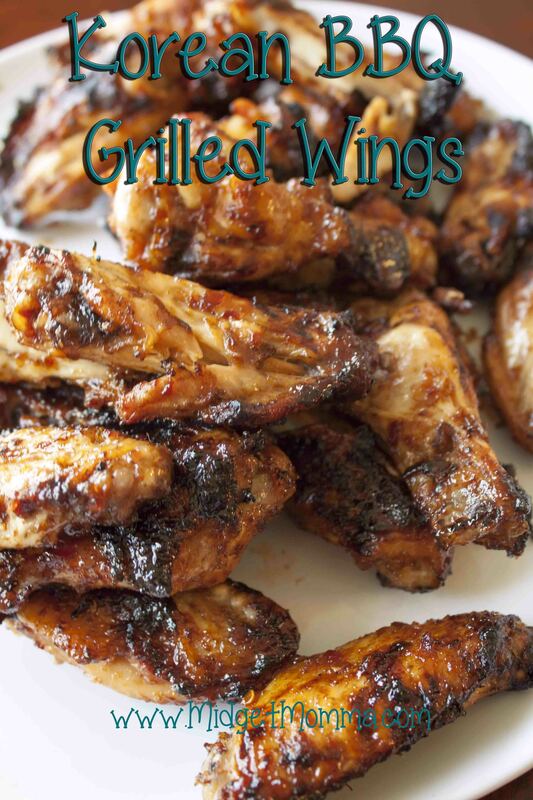 Grill wings according to package directions. During the last 5 minutes of grilling, baste wings with sauce, turning frequently.